Chris Wallace uncharacteristically gave Barack Obama's Chief Strategist, David Axelrod, carte blanche during his interview today on FOX News Sunday. Failing to challenge Axelrod's avoidance in answering questions directly over and over again, and allowing him to go on and on with the standard Obama talking points, was strikingly different than the treatment Wallace gave to John McCain's Campaign Manager, Rick Davis, who he continually interrupted to challenge, sometimes even argued with, such as regarding when the McCain campaign was going to 'allow' Sarah Palin to be interviewed by the media. 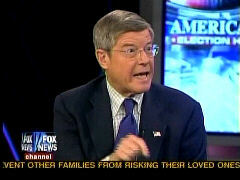 And on Saturday's Beltway Boys, Mort Kondracke referred to Palin, McCain's VP running mate, as "that Wacko Right-winger". So much for 'fair and balanced' from the liberals at FOX News. Alaska's Governor, Sarah Palin, the hockey mom with lipstick, seems to have liberals shaking in their boots every channel we turn to.